I think the reason I like garnet is because it is so ruby-esque, which is my birthstone, but so much more affordable than the precious gemstone that ruby is. Although the strands I found in Drawer 18 were cut much smaller than I usually work with, their rich color and the bail by Gita Maria which lay hidden in the drawer, convinced me this would be a nice necklace! I used three strands for this necklace; two of them I personally bought in Jaipur, India, in 1994. While living in Hong Kong, I joined the American Women’s Club which gave cultural lectures and sponsored trips. I eagerly absorbed it all, including a trip to India: New Delhi, the Taj Mahal and Jaipur. Envision 52 American women driving city to city. At every stop, local vendors rushed our buses, offering their wares. One of us was wearing sneakers with the flashing lights (some trends fortunately didn’t stick! ), and she had a major following of groupie kids and vendors whom she mesmerized! Jaipur is a major gem cutting location, so I set out, alone—it was perfectly safe—to an address recommended to me. It was closed but people managed to tell me it was Ramadan and at sunset it would re-open. I waited for about an hour, did my haggling, and purchased a half dozen strands, including the two garnet we see above. I returned to my hotel in a taxi in crazy traffic. At one point, a camel pulling a flatbed transport wagon was right beside me! Elephants were also transporting, not in the main street, but on a sort of frontage road. A great memory! 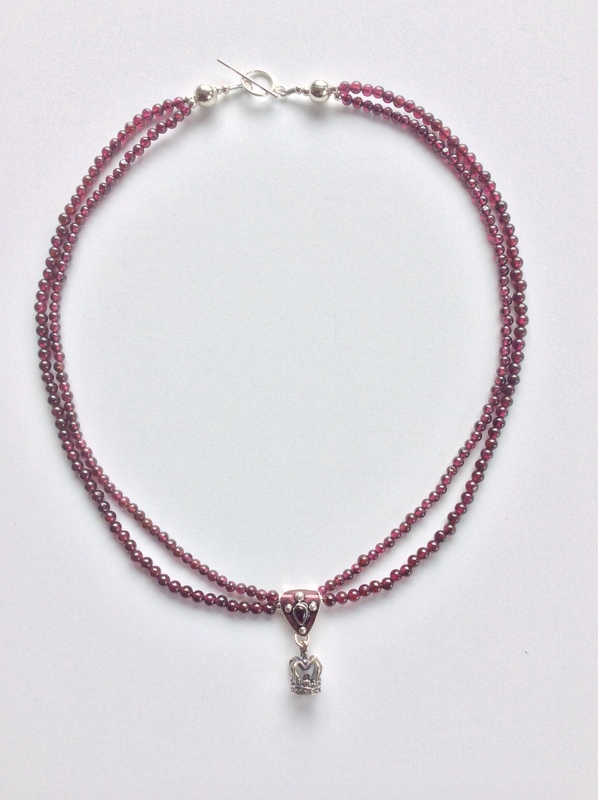 The Gita Maria (Oregon) bail is made of garnet-colored glass enamel over sterling silver and holds a sterling silver crown to celebrate that we are all princesses! 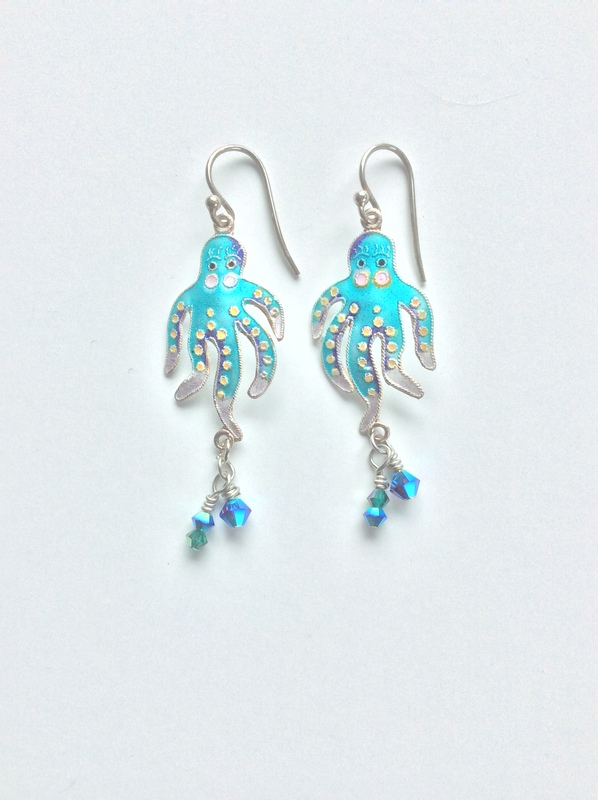 Here is a pair of Gita Maria octopus earrings from my studio. Sterling silver earwires and Swarovski crystals. $45. Garnet has been used for gemstones and abrasives since the Bronze Age. Its Latin name, “granatus”, is due to the stone’s similarity to pomegranate seeds. This necklace is 20” long with silver plated brass beads and clasp. Wear your sterling silver earrings. $89. This week’s masterpiece is simple yet elegant. Love the octopus earrings too!